Since our last website update, the council extended the statutory deadline until the 2nd February, so there is still time to WRITE NOW! The club have responded to the Environment Agency’s flooding report. We believe that this report is actually good news. Importantly the report does not object to the development on issues of principle. The further details the EA request will be dealt with through the planning process. BTDH spoke to the club this morning and they confirmed that further clarification of the transport planning and community involvement will be published on the official website next week. The club will also be meeting Wandsworth councillors to discuss how local residents’ concerns from across the Earlsfield boundary will be dealt with through the planning process and then (hopefully) construction and operational phases of the stadium. We would like to remind everyone who wants to support the club’s community stadium plan that in this extended consultation window submissions can be made online. 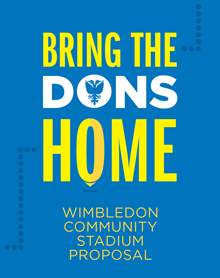 As ever we would encourage everyone, whether Wimbledon fans or not, to write in—especially those who live around the area of the proposed development. Make your voice heard and WRITE NOW!